Dr. Richard Brady owns a veterinary clinic in Cottonwood, Arizona. Up until a few months ago, he was having problems with teens purchasing tobacco products at the store next door and then loitering in front of his shop. Then the town raised the smoking age to 21. Testifying in front of the Clarkdale, Arizona, City Council as it was considering a similar move, Brady said the changes have had a positive impact. “It is a complete difference, a major success for a business owner, as well as for the health of the people and pets,” Brady said, according to the audio minutes of the October 11 council meeting. Cottonwood was the first city in Arizona to raise the smoking age to 21, joining more than 100 other cities in the United States. California recently raised the state age to 21 and more than 10 other states are considering making similar changes. California has the second-lowest smoking rate in the country and is only one of two states, following Hawaii, to raise its smoking age to 21. The California Board of Equalization, collects state administered taxes and estimates an annual loss of $68.4 million in the 2016 fiscal year as a result of the age increase. “People who start smoking before age 15 are seven to 10 times more likely to become addicted than those who wait until 21,” said Laurence Steinberg, a psychology professor at Temple University who studies adolescent development said in an email. “This is likely because brain systems that respond to nicotine (and other drugs) are still “plastic” (malleable) at that time. Thus, exposure to drugs can shape the development of these brain regions,” he said. Four states, including California, will vote in November on Proposition 56 to raise their tobacco tax by $2, a move health advocates hope will reduce smoking overall. In 2005, Needham, Massachusetts, a city of 30,000 people became the first to raise the smoking age to 21. A study published last year in Tobacco Control found that teen smoking rates dropped by 6% between 2006 and 2010. Although opponents of these changes point to underage teenagers finding a way to obtain alcohol even with a purchasing age of 21, experts say there is much less drinking than there would be if 18-year-olds could legally purchase alcohol. “The problem with leaving the age at 18 is that lots of high school kids can legally purchase them, and this makes it easy for other, younger, students to get them at parties, etc.,” said Steinberg. 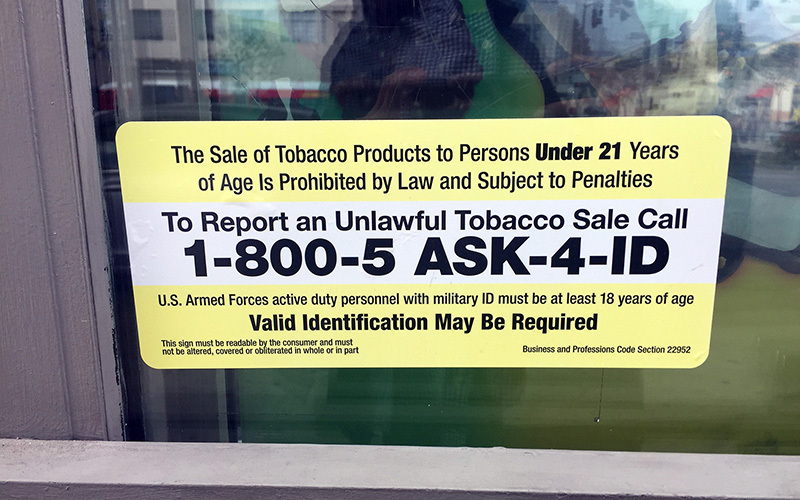 Some opposed the original version of the California bill to increase the age because they believed if 18-year-olds can fight and die for their country, then they should be allowed to buy tobacco products. An exemption was added later to exclude activity duty military personnel 18 and over. Advocates in Oregon, Washington and New Jersey are pushing for similar legislation to increase the smoking age to 21. In May, Cottonwood became the first city in Arizona to restrict the sale and consumption of tobacco and vapor products to those 21 and older. “Our council voted unanimously to support, after listening to all public comments both for and against, because although the city will lose an estimated $50,000 annually in sales taxes, the council felt it was a positive investment in our community’s health and future,” said Diane Joens, Mayor of Cottonwood, Ariz. in an emailed statement. The Mayor was approached by the Yavapai Anti-Tobacco Coalition of Youth, a group of youth who participate in the legislative process to focus on Tobacco 21. According to data obtained by the YATCY in September, 119 out of the 140 surveys taken by Cottonwood residents were in support of increasing the age to 21. “While YATCY continues to see a positive response from the community at large. YATCY does experience some negative comments from some of their peers at school at times, but YATCY youth continue to provide peer to peer education in a classroom style to provide facts of the harmful effect of tobacco products,” said Jen Mabery, health educator with the Yavapai County Community Health Services in an emailed statement. YATCY has also met with the neighboring town of Clarkdale, Arizona and its Town Council to consider changing its local ordinance. In the October 11th session, Clarkdale decided on two different ordinances which are tabled until November so that the council can make some clarifications to some of the definitions in the proposed ordinances. Organizations such as the American Lung Association also support raising the smoking age in California and hope other states follow. Their studies found that most adult smokers picked up the habit when they were teenagers and that raising the smoking age to 21 makes it harder for teens to get their hands on cigarettes and start this deadly habit. “We think it’s critical to the future of lung health that more cities and states adopt the increased smoking age. Tobacco-related illnesses are the number one cause of preventable death in the United States, so if we can get fewer teens smoking, we might be able to ensure future generations are tobacco-free,” said Vanessa Marvin, Vice President of Public Policy and Advocacy for the American Lung Association in California.